Eric Blumhagen writes "I built SOLACE with the able assistance of my wife, my idea woman. After a year and a half of work, I launched it on November 12, 2000. It now hangs from our living room ceiling when not being used on Washington lakes. We built SOLACE from the Sunset kit from Stillwater Boats, designed by Lewis Moore. It is 15'6" long and 33" wide. The boat weights approximately 50 pounds. The shell is stitch-and-glue plywood with fiberglass and epoxy sheathing on the exterior and epoxy coating on the interior and decks. 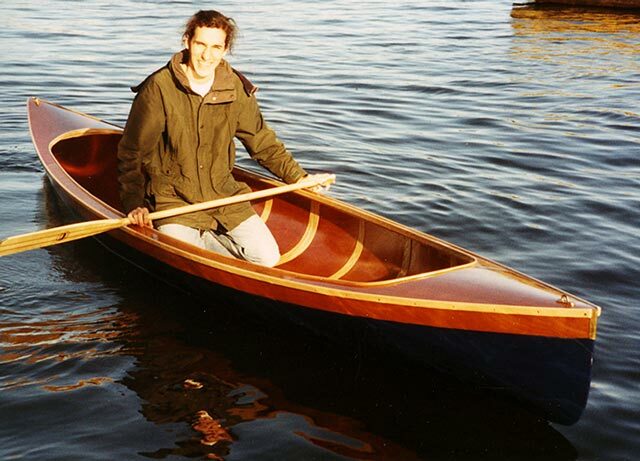 The shell uses vertical joints in the plywood to obtain a round-bottoms canoe shape with only four identical pieces of plywood.